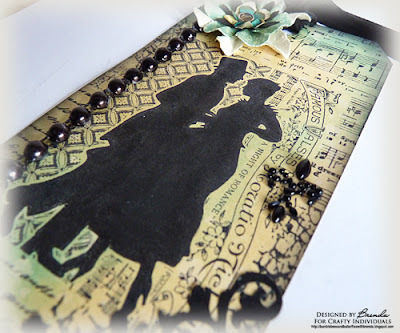 I have a beautiful new silhouette stamp from Crafty Individuals to show you today. A Night of Romance. This tag was quite easily made (that sounds as if this didn't take me long to do, but in fact it took me hours of thinking and designing time again!!! ), anyway to achieve this effect I blended antique linen over the tag and some peacock feathers DIs. The image was stamped fairly centrally and then I cut a mask to cover the whole design, that then allowed me to continue with the collage theme and I stamped the CIs music, crackle and a text stamp around the edges. The corner flourish is a new vintage Joy die and I added a few gems to it. The flat backed pearls were alcohol inked to achieve the black finish and my flower is a mixture of Prima and die-cut petals. A black gem strip and black ribbon and it's done. When this post goes live I will be travelling back from my holiday, so catch ya later and have a great weekend. Stunning! I am a huge fan of collage stamping and you have achieved it here brilliantly. So classy with that black against the muted colours and I love the addition of the pearls along the side and on that beautiful corner die!! Save travels and welcome home!! A stunning creation in the neutral shades Brenda and the image is just beautiful. just gorgeous Dawn this is a very romantic pece! I love it! This is beautiful! Love all of the different stamps and how you have put it all together. Safe travels. it looks so romantic Brenda...awesome! Hope you enjoyed your stay and wish you a safe journey! Where have I seen this beauty before? Oh that is right, in my craft room! Hey, I know how fabulous it is and I thank you again! By now you are back at home and I hope your weekend is wonderful! BTW, I miss you also! Hugs! A gorgeous tag, the silhouette image looks great. Love the way you've used this stamp Brenda, and beautiful embellishments. Beautiful tag, love the colour combination. Safe journey home. Hey Brenda - your tag is quite romantic, very elegant, full of class and beautifully designed! Super gorgeous! I love the color and the people and the line of beads...great design! A fabulous tag - I love that stamp. 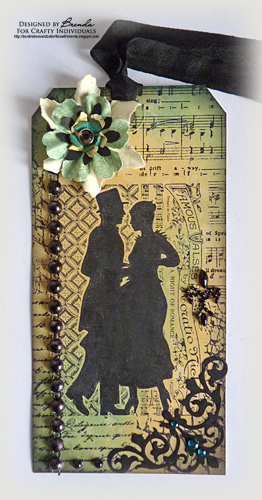 Vintage, nostalgic, romantic - lovely tag! So elegant and beautiful! Love the silhouettes.